This post is not a political critique (although the above image would suggest otherwise) nor is it a call to boycott Russian products. Both those things have been addressed by people more powerful and smarter than myself. The purpose of this post is simply to draw attention to the good fortune that many of us take for granted. 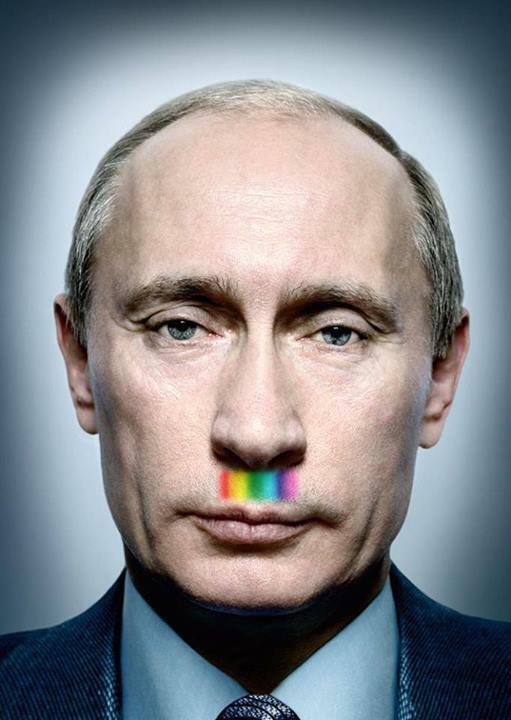 While our gay brothers and sisters in Russia have their rights stripped away, we in America, Australia, Canada, the UK and countless other countries have the freedom and security to demand even more rights. We take to the streets in large numbers, rainbow flags held high without the fear that we’ll be beaten by our own police or tortured by our fellow citizens. Our governments allow us the freedom to fight for equality even if they’re slow to respond. This isn’t the case for everyone. While it may sometimes seem impossible to change the world, we do have the power to change how we personally view the world. Let the situation in Russia allow you to see the blessings in your own life. When you look at the bigger picture, the little things that seem to worry you the most fade into insignifcance. Money, cars, clothes, gym, parties, holidays – these things don’t matter to someone whose basic human rights are in jeopardy. Next time you’re at a gay venue, with your gay friends or holding hands with your boyfriend, take a moment to realise that those simple actions aren’t afforded to all men. We also forget that the privileges and rights that we take for granted are often awarded to us by factors completely out of our control. I’ve often struggled with my life circumstances. I was born a healthy (white) baby into a well-off family, given the best education, had all my needs met, within a society that allowed me to express myself and I had absolutely no say in the process. Why’s that a struggle? I could have just as easily been born into poverty and ended up as one of the almost 1 billion starving people in the world, fighting to survive each day. By fate, or God’s will or the universe’s intention I was dealt the luckiest hand of cards before I even began playing the game of life. It sometimes take external events like the current situation in Russia to make us realise the blessings we have in our own lives. Take a moment to reflect on what’s really important and perhaps you’ll realise that you are a lot more fortunate than you think.